I looked out my office window this morning, and saw the light on the chestnut tree across the street. Grabbed my camera, and went to take a picture through the window. Sergei saw this as an opportunity for petting, and walked across the windowsill just as I took this shot. 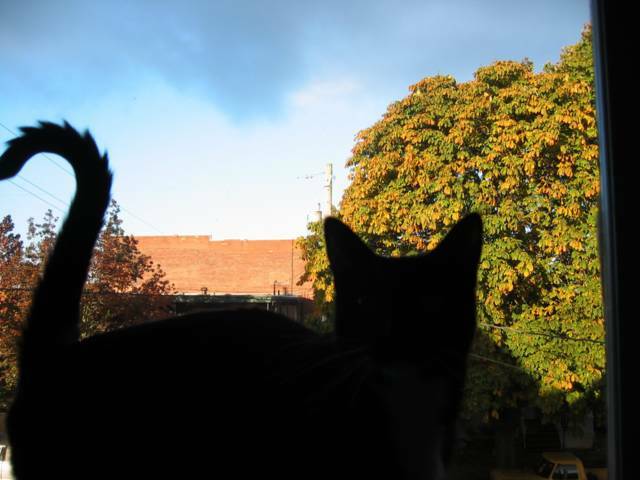 Luckily, he didn't block the view of fading leaves shining in the low morning light, or the hazy blue-gray sky beyond.